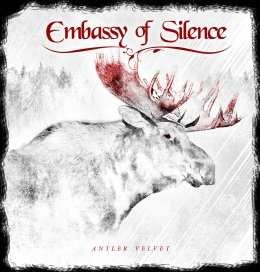 Antler velvet is the new album from Finnish band Embassy of silence. Their last album, "Euphorialight" went down well with fans and reviewers and set a high standard for them to try and beat with the new album. The music probably falls somewhere between symphonic metal and melodic rock, and fans of Delain are likely to find it of interest. There are plenty of musical twists and turns giving the album a varied and interesting feel. "Trickster queen" gets the album off to a great start, and has a very warm rich sound that reminds me of Delain at times. "Unconverted" is another excellent track - and really these first two songs tell you what to expect from the rest of the album - top quality music with some beautiful female vocals from Ines Lukkanen. The vocals are a real highlight of the album - Ines has a beautiful voice and it really works well with the music - it's a voice that you can listen to all day quite happily. This really is an excellent album that's really impressed me. This is an album that is definitely worth buying, and a band that is well worth keeping an eye on - I really hope to see them play live before too long.